Josh Strauss has made 10 good tackles so far this game. Billy Burns has kicked a conversion. Gloucester are stopped just a few metres from the try line but John Afoa picks up from the base of the ruck to score the try. Trouble here as Henry Purdy breaches the defence. Sale decide to make a substitution, with Francois de Klerk getting some game time. Sale decide to make a substitution, with Alan MacGinty being replaced. The Sale supporters go wild as Will Cliff successfully kicks the conversion. An interception by Byron McGuigan allows him to race away to score. A gap opened in the defence and Byron McGuigan took full advantage. The defensive line has been broken as Motu Matu'u goes through the gap. Gloucester make a substitution with Ben Vellacott coming on. Gloucester make a substitution with Jason Woodward coming off. The touch judges raise their flags as Alan MacGinty kicks the conversion. Sam James scores an interception try. What a run here by Sam James as he gets over the gainline!. 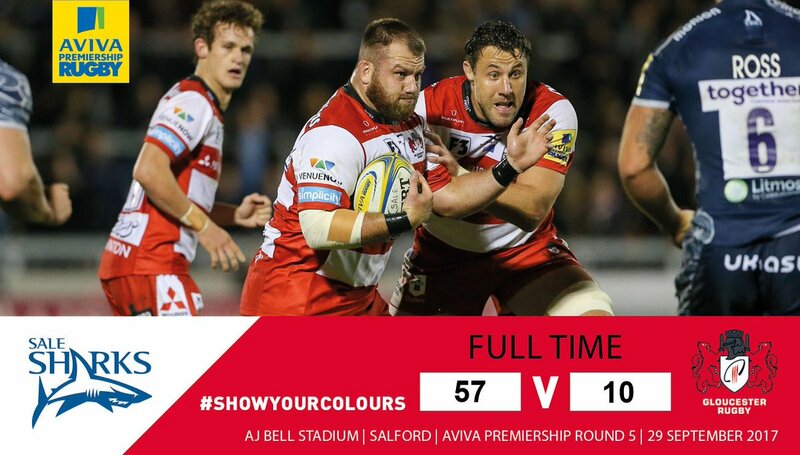 Gloucester have won 140 rucks so far this game. Ed Slater makes the break as the defence re-enacts the parting of the red sea. Gloucester have won 120 rucks so far this game. Fabulous play by Sale has led to Denny Solomona being able to wriggle through a gap. Sale sub Andrei Ostrikov comes onto the field. Josh Beaumont departs for Sale. Trouble here as Lewis Ludlow breaches the defence. This is dangerous for the defence as Halani 'Aulika bursts through to advance the Sale attack. 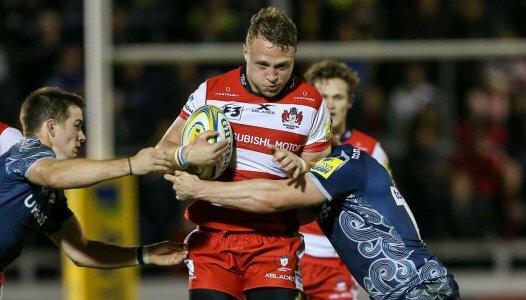 Owen Williams comes on for Gloucester. David Halaifonua leaves the field. 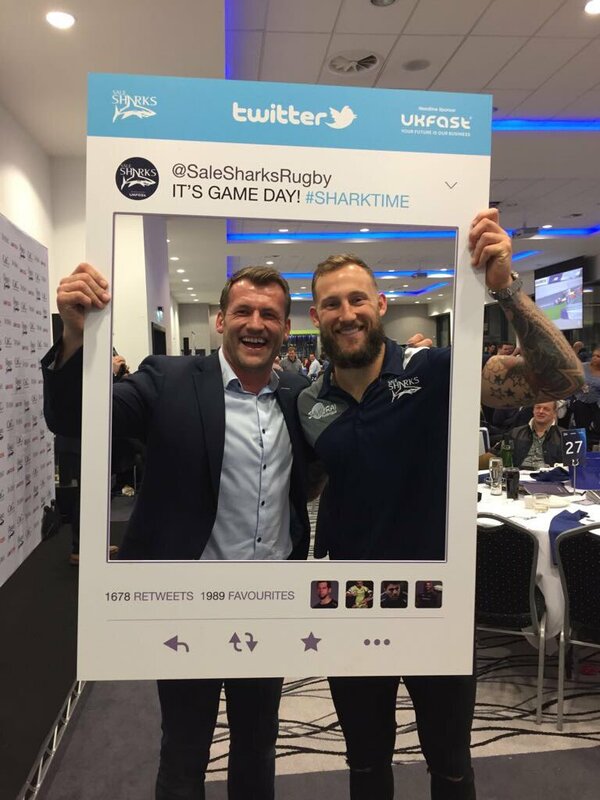 Sale decide to make a substitution, with Will Cliff getting some game time. Sale decide to make a substitution, with Francois de Klerk being replaced. Sale make a substitution with James Flynn coming on. Sale make a substitution with Ross Harrison coming off. Alan MacGinty adds the two points for Sale. Sale sub Halani 'Aulika comes onto the field. Alexandru Tarus departs for Sale. That's a great try assist by Francois de Klerk. James O'Connor scores the try from close range. A gap opened in the defence and James O'Connor took full advantage. John Afoa comes on for Gloucester. Gareth Denman leaves the field. Sale decide to make a substitution, with Cameron Neild getting some game time. Bryn Evans sets up the try. Alan MacGinty does the business as his conversion attempt goes over. Great hands by Sale leads to a try for Denny Solomona. The defensive line has been broken as Sam James goes through the gap. Sam James has made 10 good tackles so far this game. Alan MacGinty makes no mistake with that conversion attempt. Sale are only a few metres out, surely they must score! And they do with Francois de Klerk touching down. Billy Twelvetrees (Gloucester) is shown a yellow card. Sale sub Tom Curry comes onto the field. Alexandru Tarus has made 10 good tackles so far this game. James O'Connor comes on for Sale. Mark Jennings leaves the field. Alan MacGinty kicks the penalty. What a run here by Josh Strauss as he gets over the gainline!. Freddie Clarke makes the break as the defence re-enacts the parting of the red sea. Byron McGuigan intercepts the pass to race ahead and score the try for Sale. Fabulous play by Sale has led to Byron McGuigan being able to wriggle through a gap. Ben Curry has made 10 good tackles so far this game. What a kick! Byron McGuigan takes full advantage to score for Sale. 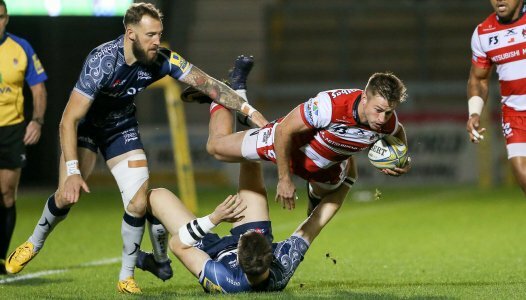 This is dangerous for the defence as Ruan Ackermann bursts through to advance the Gloucester attack. Billy Burns has kicked a penalty goal. A gap opened in the defence and Denny Solomona took full advantage. Alan MacGinty has kicked a conversion. The kick through from Sale has allowed Denny Solomona to touch down. The defensive line has been broken as Denny Solomona goes through the gap. 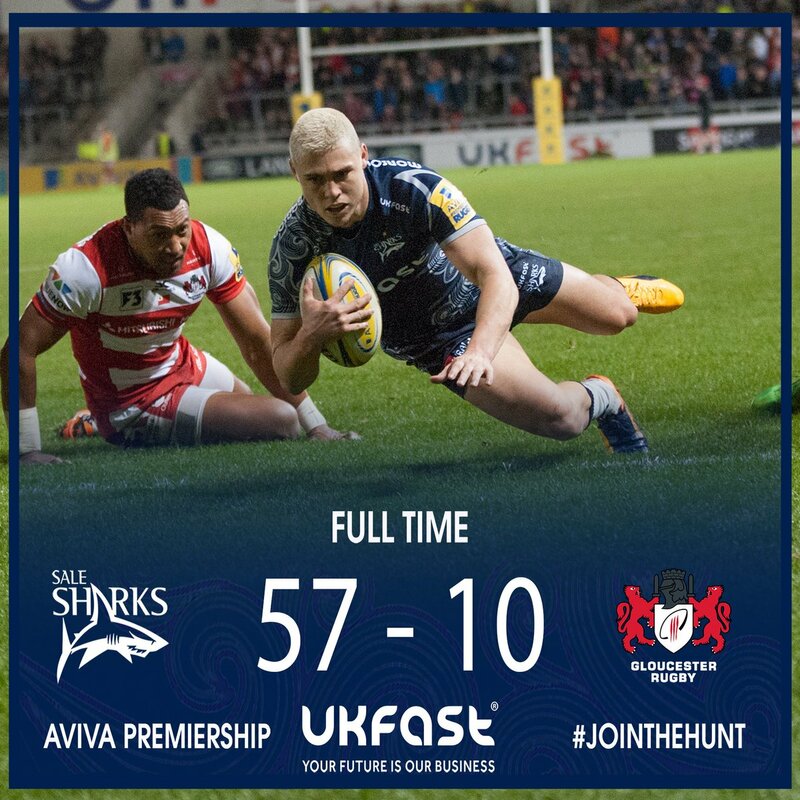 Read the match report on Sale Sharks biggest win since 2004! It's a gr-eight night for the hosts with an emphatic victory! We’ve won a scrum! Sale knock on in their own 22. 5 to go in Salford. 71 - Glos Rep - Ben Vellacott ON, Jason Woodward OFF. @hazel1973 I’m driving as well! 64 - Turnover ball for Glos inside the Sale half. WiFi still no existent... not that you care! Glos Reps - Owen Williams, Tom Savage ON, David Halaifonua, Ruan Ackermann OFF.